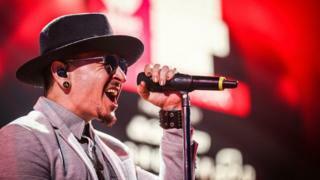 Linkin Park records are flooding the charts following the death of the band's frontman Chester Bennington. Nine of the band's albums are in this week's top 100, five of which are inside the top 40. Lana Del Rey's new album Lust for Life tops the chart, making it her third UK number one, according to the Official Charts Company. Despacito is still number one in the singles chart, which it has now topped for 10 non-consecutive weeks. Linkin Park's debut album Hybrid Theory is their highest-placing album at number four. It includes hit song In the End, which is the highest-charting Linkin Park entry on this week's singles chart at number 14. The band have now become the first US band in 50 years to secure three albums in the top 10. In the singles chart, Luis Fonsi's Despacito - featuring Daddy Yankee and Justin Bieber - becomes one of only five tracks to have reigned at number one on three separate occasions. Bieber's 2015 hit What Do You Mean has previously achieved this record, making him the only artist to have achieved this twice. Following closely behind the Spanglish track is DJ Khaled's Wild Thoughts, featuring Rihanna and Bryson Tiller, at number two. It's been a great week for the three artists as the song has also been nominated for video of the year at the MTV Video Music Awards 2017. MTV VMAs: Which of these is the best music video of the year?